Shown at the Henderson-Vance Chamber of Commerce ribbon cutting for the Advanced Wound Center at Maria Parham Medical Center are, Brian Sinotte, CEO, Maria Parham Medical Center; Dr. Joseph Franklin, Medical Director, Advanced Wound Center; Kathy Thomas, Clinical Nurse Manager; and other representatives of the wound center and hospital; Mayor Eddie Ellington; Vance County Board of Commissioners Chair Gordon Wilder; Commissioner Tommy Hester; state Senator Angela Bryant; HVCC President John Barnes and other chamber Board members and staff; friends, family and other business leaders. 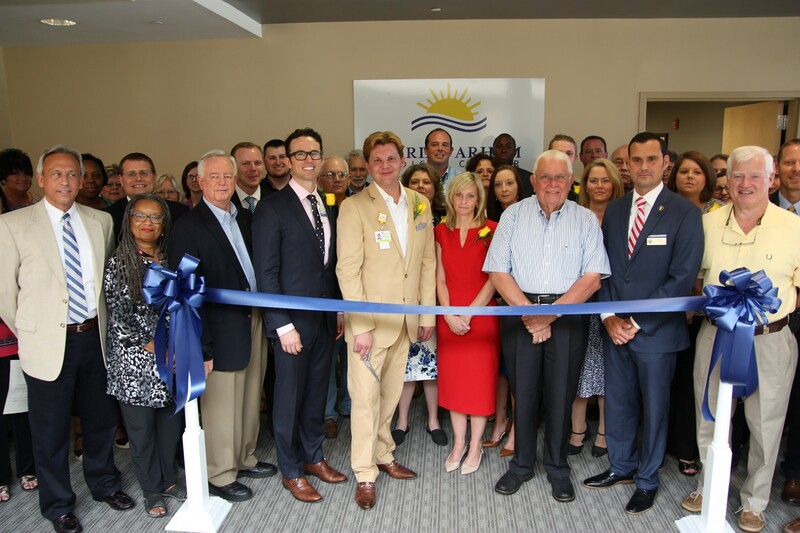 The Henderson-Vance Chamber of Commerce celebrated the opening of The Advanced Wound Center’s new location with a ribbon cutting on Thursday, July 14 at 4:30 p.m. at their Ruin Creek Road location. “This is only one of more ribbon cuttings to come,” said Brian Sinotte, CEO, Maria Parham Medical Center. Dr. Joseph Franklin, Medical Director made remarks about the new advanced technology of the center and that his overall goal is to bring care to those that can’t go to larger healthcare facilities. Remarks were also made by other representatives from the hospital, city, county and state officials about The Advanced Wound Center and how MPMC continues to grow and serve the needs of the community and surrounding areas. At MPMC Advanced Wound Center, their team of providers help individuals struggling with wounds get on the fast track to recovery by managing their persistent wounds and ulcers with the latest technology and treatments. In just the last five years, The Advanced Wound Center has had over 20,000 visits. The new center offers two chambers for hyperbaric oxygen therapy (HBOT), an advanced therapy for patients who suffer from chronic wounds that are not responding to traditional therapies. Patients are placed in a pressurized chamber where they breathe 100 percent oxygen. The treatment delivers more oxygen to the body’s tissues, helping to heal wounds, save limbs and repair extensive tissue or bone damage. It is a pain free approach to treating more than a dozen medical conditions and is approved by Medicare to treat patients with a variety of medical conditions.